Life is too short to waste time singing in your shower, it’s time to take charge and unleash the singer within you, with Strepsils Pakistan latest campaign ‘Strepsils Cool Awaz’. Mr. T (Strepsils Adorable mascot) is here to help you find the hidden singer inside you. All you have to do is log on to Strepsils’ Pakistan Facebook Page and sing your heart out; you can also send in your entries over your smartphones. 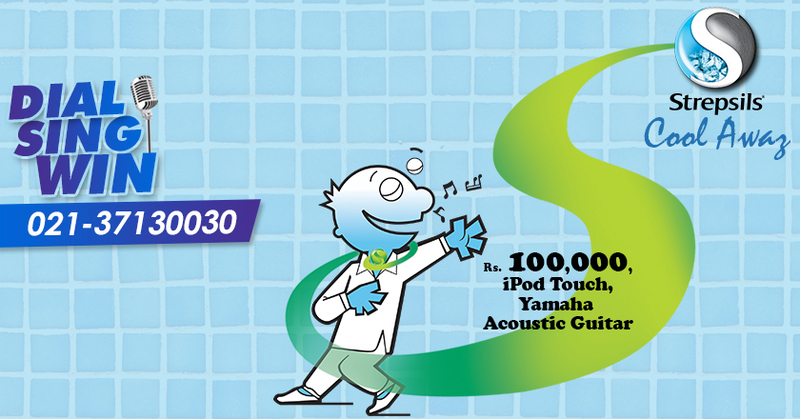 The competition has a hefty winning cash prize of PKR 100,000 and an iPod Touch & Yamaha Acoustic Guitar to the runners up. The process is simple. Dial, Sing and Win! Participants have to simply dial 021-37130030 and they shall be instructed to record a song of their choice, in their voice, for 30 seconds. Upon submission, the entry will be entered directly into the competition. Once the submission process has ended, Top 20 contestants shall be chosen and contacted. After a second round of recording, Top 10 entries will be posted on their Official Facebook Page for the fans to Listen and Vote according to their preference. If you think you can be the next singing icon then here is your chance to prove it and make loads of money on the way!